Pasta flora? No, The Greek Vegan hasn’t gone Italian – pasta flora is a delightful traditional jam tart and one of the most delicious, authentic sweet treats of Greece! A light, cookie-like crust with jam filling, this positively lovely dessert is found in Greek bakeries all over the world and can be on your table in less than an hour using ingredients in in your kitchen right now. Ready? Set? Go!! Oh and pasta flora can be made as individual tarts too which is always a fun presentation – I’ve used a whoopie pie pan successfully for this! This recipe is ridiculously simple which you’d never guess when looking at the finished product! It’s more of a not-too-sweet cookie crust when it’s cooked, not like a pie crust. It holds up under the jam and the cookie texture/jam combination is amazing. Just combine dry ingredients, except sugar, in one bowl and wet ingredients including sugar and orange zest in another then mix together. Done. I recommend dissolving the sugar in the orange juice before whisking in the oil as things just seem to come together better when you go this route. a very simple dough behind this very pretty dessert! If you haven’t worked with oil doughs before, don’t be put off by their slightly greasiness. It may take a minute or two to get used to the different feel and then you won’t even notice. I find it helps, when I have the time, to refrigerate the dough in plastic wrap for 10-15 min at least. And the easiest way for me is to shape the dough into a log about 1 foot long, wrap in plastic wrap and then when ready to use, just mark off the log in thirds using 2/3 for the tart pan with 1/3 set aside for the dough snakes on top. When rolling your dough snakes, work at a brisk pace and I recommend you use a bit of flour to roll with. For a 9″ tart, you’ll need at least 8 snakes – 4 on the bottom layer and 4 across the top. You can use as many as you like but for a nice lattice, at least 4 on top and 4 on bottom are needed. 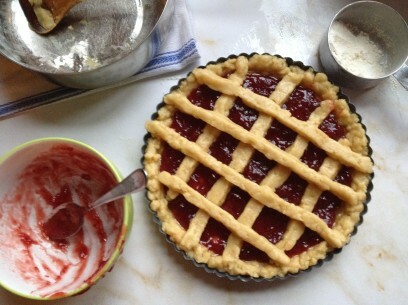 Once your bottom crust is down, spoon the jam onto the dough and spread out evenly to the edges. Using the reserved 1/3 of your original dough log, just divide into 8 pieces. The dough is VERY forgiving so if your dough snakes break or aren’t quite long enough for the section you want, just pinch broken ends together or pinch on an extra piece. Once rolled, gently lay dough snakes first over the jam and then the next layer cross wise over the first. If you don’t like the way your lattice pattern looks, carefully remove your dough snakes, wipe off any jam and roll out again or just rearrange. This is the most traditional lattice pattern but feel free to get creative and add slivered almonds to the jam squares in between the lattice! In a small bowl, mix apricot jam and brandy until combined and set aside. Combine dry ingredients (except sugar) and set aside. Whisk together orange juice and sugar. Add orange zest and sunflower oil. Whisk until well combined. Add flour to liquids in 2 parts. Mix to completely combine and form into smooth ball of dough. 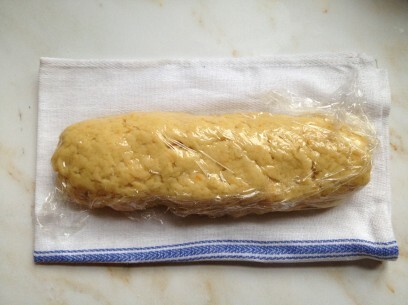 Roll dough into a log about 10-12 inches long. If you have time, wrap in plastic wrap and refrigerate for 10-15 minutes or up to 2 days. Remember to let it sit out at room temp for 30 minutes before using if you keep it refrigerated for more than 2 hours. Mark off the dough log into thirds and cut off one third. Set the small piece aside. 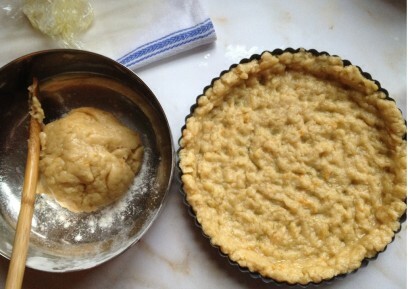 Use the remaining two thirds piece of dough for the bottom of the tart pan. Press the dough along the bottom and up the sides of pan with your hands or even the back of a wooden spoon until you get an even layer all around. 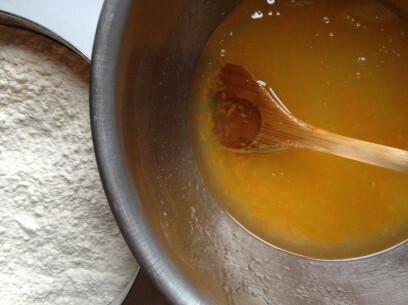 Spread apricot (or your choice of) jam in an even layer over the dough. Divide small piece of dough into 8 pieces. 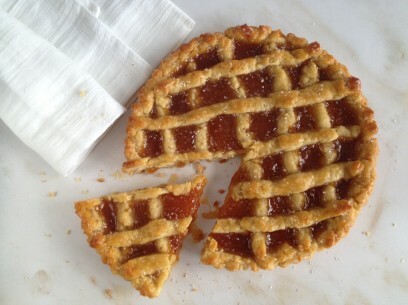 Roll each piece and lay across the top of the jam in a lattice pattern (see picture above). If the dough snakes break, simply pinch the ends back together. When laying the bottom layer of lattice dough rolls, fit the end of each snake inside of the dough side wall. The top layer of lattice should have the rolls go all the way from the edge of the tart pan, over the side and across to the other pan edge. Bake in 375 degree oven for 35 minutes. Tart should be a soft golden brown and the edges just a bit darker brown. This looks both delicious and lovely! Would a different type of oil work for this dough instead of sunflower oil? I only have olive and canola in my pantry at the moment. What do you say about substituting a good vanilla extract for the vanilla powder? 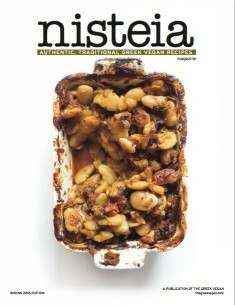 Hi Kiki – tried it and it has promise, considering… I will make it again for Christmas, now that I know the recipe. For me, the jam filling was too sweet. I will substitute a preserve with sugar content of 7g instead of 9g that I had used. Also, since I expected the standard presentation of recipe ingredients, I mistakenly omitted the oil, then had to dump it in at the end, when I realized it was up there as the first ingredient. Probably the dough will have better texture on my second try. I had missed it on the way to the jam filling which seems to intercept the wet and dry ingredients.. Perhaps, reprint with reorganized list of ingredients? Anyway, thanks for the recipe and Kala Xristougenna. Lovely!!!!! You learn something new every day. I had no idea the Greeks made this too. I am south american and this is very popular in Uruguay, Argentina. But we call it Pasta Frola. Our recipe is made with butter, well I now use vegan margarine. We traditionally fill ours with quince paste, but dulce de leche (caramel) is my favourite. I have also made it with hazelnut paste. Hm, I’m going to make one this weekend. A couple of suggestions for this recipe: 1 – mention the size of the bowl needed each time (I used a small one for the sugar + juice since I didn’t realize that would be the one that would have to fit everything in it) and 2 – write the names of the ingredients meant to be combined each time (I thought the orange zest was part of the “dry” ones and only later understood it was meant to be with the sugar & oil). Thanks again and I hope you keep those recipes coming!